Join us for a very special presentation by A.K. Summers, who will discuss how alternative comics and queer zines share a common punk/DIY ethos as well as subject matter which often celebrates pulp, the misanthropic, oppositional, outlandish and unnatural. She will connect these and other influences in her work, as well as her own comic zine from the 1990s, Negativa, and eventual long-form graphic novel Pregnant Butch (2014). Summers’ work strives to depict butch dyke identity and desire—and to critique one-size-fits-all orthodoxies of gender, sexual and commercial culture. 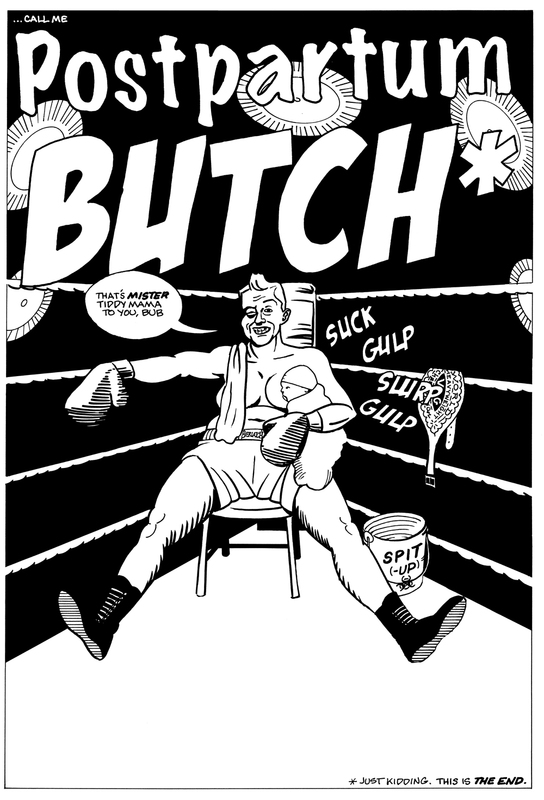 As a young butch, she often found inspiration in the alternative or anti-masculinities portrayed in the works of comics luminaries Hergé, Jaime and Gilbert Hernandez, Daniel Clowes, and Tom of Finland. Theirs was an aesthetic which conveyed desire itself: through the crisp, graphic beauty of the artwork and through the willingness of these artists to show themselves (with the exception of Hergé) as flawed, nerdy and desirous artists. She was heavily influenced by the 1990s explosion of zines, zine artists and performers like G.B. Jones, Bimbox, JDs, Vaginal Crème Davis, and Boyd MacDonald. These artists demonstrated what could be done with absolute creative freedom, no-holds-barred furious hilarity, a passion for raunch and unmatched talent for juxtaposition. A.K. Summers is the author and artist of the graphic memoir, Pregnant Butch (2014 Soft Skull Press-Counterpoint), which was nominated for a 2015 Lambda Literary Award and included in 2015 Best American Comics as a notable comic. A.K.’s presentation is part of the programming for Our Comics, Ourselves: Identity, Expression, and Representation in Comic Art. Her work can be seen on exhibit at Interference Archive from January 21-April 17, 2016.